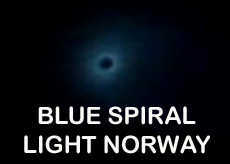 A spectacular blue spiral light that appeared over Norway has been creating some interest on the internet, since it was first seen yesterday. But what caused this light show? There have been a number of explanations offered, but it is probably safe to say it was not a UFO (of the Alien kind). Some have suggested it was created by lasers, while others are inclined to think it was an out of control Russian missile. The best idea (in my opinion) is that it was either a rocket or missile that had probably re-entered the atmosphere, or from a high altitude, and developed a fault with its guidance system or propulsion engine. Leaking fuel might cause the spiral image seen as the object fell towards the ground, spinning out of control. The colour may have been connected with the fuel used and a combination of temperatures? The light seen coming from the centre of the spiral at the end of the light show, could have been the object itself falling to the ground. Chances are the culprit for this display will be found later, if the landing spot can be located. If it was a missile, who did it belong to? The Russian’s have denied any missile tests in that area and at that time. It might be some craft that was orbiting the Earth and made an unscheduled return, but it would need to have been quite large for any of it to remain after re-entry. Logic seems to suggest that it was a rocket of some kind (or a rocket propelled craft), but there appeared to be no controlled explosion carried out, which is unusual for a device like this, when control is lost. Perhaps we will receive more news on this event later, which will answer our questions? Unfortunately, if it has a military connection, we are not likely to hear much more about it. And if it was a UFO, you can be certain nothing will be said! Whilst writing this article there have been a number of unconfirmed reports that it was a failed Russian missile launched from a submarine, but we shall have to wait for more official confirmation of that.